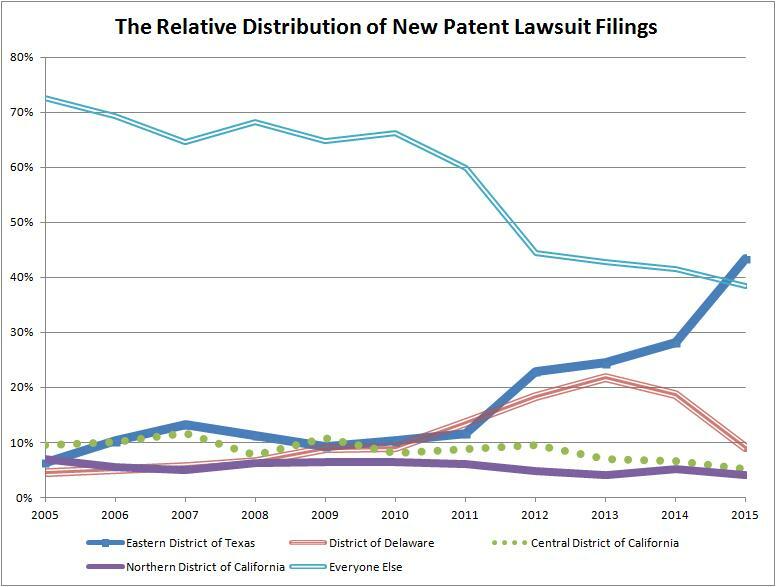 The chart below shows the relative distribution of new patent lawsuit filings (complaints) over the past decade. I included the top four most popular jurisdictions (E.D.Tex., D.Del., C.D.Cal., and N.D.Cal.) and also a catch-all category for the sum of the other 90 or so districts in the country. You’ll note that E.D.Tex. has been the leading district almost every year for the past decade, but that growth has increased since the AIA (2011) and even further increased in 2014 and 2015. Part of ramp-up comes from the fact that the E.D.Tex. cases already had more defendants-per-patent and the joinder provisions of the AIA could be seen as a natural expression of that phenomenon. However, the rise in 2015 can’t be so easily explained. If you calculate the HHI, this now looks like a very concentrated market. Here is what must be done by our method. Italics: Necessary to perform the method function in the real world. In other words, this must be done to optimize a group of people’s calendars, just said in obtuse language. Bold: Computer monitor. This anchors it to the real world. Not shown: Something that differentiates this claimed method in such a way that I could write a competing calendaring software. This is not an appropriate use of that statistic, as there is no danger of monopoly here (the choice of filing in any district remains open). It’s “cute” to use the term, but tends to show an anti-patent bias (monopoly…?) more than anything else. Wow. Did anyone see that one coming? There are 94 active United States district and territorial courts, yet this chart shows that one single district court out of the 94 [in a small town relatively non-industrial district] now gets 44% of all new patent suits. To any rational observer that is highly concentrated. You do realize, curmudgeon, that the point was NOT about whether or not a rational observer would find the concentration to be highly concentrated or not, right? Can we grow up just a little and remove the silly IP address block….? The TPP intellecutal property chapter was reportedly (a href=”https://wikileaks.org/tpp-ip3/WikiLeaks-TPP-IP-Chapter/page-17.html”>leaked today . Would an implantation act implementing article QQ.E.1 overrule Alice? Re: overrule: Are you kidding? No! The TPP requires Technology! What is technology but a new or improved machine, manufacture or composition, a new or improved method of making one of these, or new use of these to produce an improve technical result? CAFC issued a Rule 36 affirmance this morning of Judge Sleet’s (Del) $1.4 million fee shifting penalty against Acacia’s subsidiary troll Summit Data Systems. The victorious defendant in this instance was NetApp, represented by Ed “$1000+/hr” Reines of Weil Gotshal & Manges. Other defendants who were sued have also obtained fee awards so it looks as if Acacia will be paying quite a bit for its behavior. MM, troll? They sued a company for using a Microsoft product. The problem, Microsoft was licensed. Somewhat off topic (the case arose out of Virginia — another popular venue) but the oral arguments today in Amdocs v. Openet are worth a listen. They are alternatively extremely depressing (CAFC judges incapable of understanding the basics about subject matter eligibility and the relationship of prior art, e.g., the Internet, to the claimed “innovation”; a defendant’s attorney who can’t bring himself to state the obvious problems about patenting logic) and exciting (brief moments of insight about the system as a whole and why the CAFC is constantly dealing with 101 issues). Okay, judge (Reyna? ): just follow your own reasoning one more stepn and you’ll understand why abstractions (e.g., applications of logic to information processing) don’t belong in any sane patent system. Hooray! Patent attorneys are learning! Judges Newman, Plager, & Reyna on the panel. If I understood the claims being discussed, data was drawn from disparate internet devices and assembled into one report. Everything in the claim was old but the source of the data. The lower court had held the claims abstract because beyond the idea of a specific source, there was nothing at all new. The claims were effectively claimed at the result level — do it. Get the data and assemble it into a single report. The attorneys seemed not well versed in Rubber-Tip pencil — although one of the judges alluded to it briefly when he asked whether the idea of attaching one thing to another was abstract. All present seemed to agree. The claim became less abstract when it was limited to a hammer and a nail. At least some of the court seem to understand the issue, but the handwriting on the wall suggests a decision that would fundamentally conflict with Rubber-Tip Pencil. Another amusing aspect of this oral argument was the strange discussion over how this keep-track-of-stuff “technology” “improved” the existing Internet. The answer was that it did so indirectly: the “technology” allowed content providers to bill people more accurately … then the providers could put more content on the Internets and charge more and more people for more and more stuff. So awesome! Because there’s a real shortage of ways to charge people for stuff. Or there was in 1992, evidently. I mean, I obv agree that this was the case but frankly I also lay a great bit of the blame at the feet of the congress who have done nothing in the 101 area to bring statutory clarification. 6, I think congress knows full well how complicated patent law is. They are not willing to rewrite the most fundamental patent statute of all, 101, thinking they can do a better job than the Supreme Court. When they address specific issues, they do so narrowly — preventing patents on the actually treatment of patients, patenting human beings, patenting of financial methods. The words of Jefferson have stood the test of time; and I predict, they will continue to exist, unmolested by the self-interested, until the US no longer exists. Too late Ned – once again, you refuse to understand what actually happened in 1952. There’s a lot of blame to be passed around. The CAFC had a chance to step in and do something a few years after the PTO handed out a certain “managing financial services” claim to State Street Bank in 1993. But they decided to throw gasoline on the problem instead. And Judge Plager was on that State Street panel. I’m guessing it was his snide comment regarding the “plague” (you’d think these judges would have learned something by now but evidently not). Thanks for the recording link 6, I will save my comments for a dedicated thread (unless one does not arise within a few days). And the plague caused by the patent office was in turn caused by the Federal Circuit in State Street. The problems in the early 90s weren’t “caused” by State Street Bank, which came at the end of the decade. But the PTO’s struggles with subject matter eligibility and, more specifically, it’s ability to the examine “do it on a computer” and info processing logic process patents generally, were evident well before State Street Bank. The CAFC’s contribution was simply to clap more loudly. The real plague of ineligible should-never-have-been-granted junk has yet to land on the shores on the CAFC’s docket. That’s the junk that was granted over the next 15 years when it turned into a genuine free-for-all. Some skillful questioning from the judges of both sides in this case. * “Conventional” hardware can be used to bring about non-“abstract” inventions. * Claims cannot be dismissed as “abstract” based on an overgeneralized reading of the claim language that overlooks a claimed implementation. I don’t expect all of Amdocs’ patents to survive, but it seems very likely that DDR Holdings will no longer be the sole survivor at the Federal Circuit for post-Alice 101 decisions. David, simply, the novel subject matter is claimed at the level of abstraction — do it. What does that even mean, Ned? Are you aware of the ladders of abstraction? Are you aware that at least 95% of claims of any meaningful value utilize the ladders of abstraction? Are you aware that for 101 purposes, the claim as a whole is what is important? We’ve been over the changes in patent law for combination claims. I have shown you how Federico himself noted what Congress (not Rich) had done. You are going to have to try harder, my friend. A. you pulled that number out of your behind. B. yes, cheating usually does put you ahead of the game. Aa) the number is indeed a guestimate. Ba) There is no “cheating” here, as this ladders of abstraction is simply the way that science, engineering and the law works – this has been amply demonstrated to you. Just because you “don’t get it,” does not mean that such is the way the world works. Bb) Time for you to grow up son. Just because you “don’t get it,” does not mean that such is not the way the world works. We at EFF have done quite a bit of inquiry into this issue. Although it may be true that patent owners fair no better in ED Tex on the merits than any other jurisdiction, relying on that to question why patent owners would file there in the first place would be a red herring, as it assumes that all patent owners want a merits decision. Collectively, rules such as these increase settlement pressure on patent defendants who may well be victorious if a merits decision were made. But when a patent owner asks for less than the cost to get to a merits decision (ED Tex grants summary judgment at a much lower rate than the rest of the country), it is not surprising that defendants may consider settlements to be the best business decision, even if it is not related to the strengths of the merits. Thus what you get in ED Tex is a forum that is attractive to those patent owners with dubious claims or patents. Here is one example: Eclipse IP (now Electronic Communication Technologies, LLC and a 100+ lawsuit patent owner) recently started filing a majority of its cases in ED Tex. This was after Judge Wu in CD Cal invalidated several of Eclipse’s claims and had issued a scheduling order which noted that ” the Court is concerned that at least some of the Eclipse Cases have the potential for resolution to be driven primarily by the costs of defense” (See ECF 33, Case No. 2:14-cv-154, CD Cal). A defendant in ED Tex filed an Alice 101 motion to dismiss and Eclipse IP went so far as to move to strike the motion (See ECF 18, Case No. 2:15-cv-363, ED Tex), saying it was contrary to the Judge’s rules requiring permission to file the motion. Although Judge Gilstrap did not strike the motion (See ECF 21), it seems likely that Eclipse was relying on the judge’s rules in order to avoid a similar quick invalidation and aggressive case management that Judge Wu engaged in. Thank you for the info. Keep up the good work! relying on that to question why patent owners would file there in the first place would be a red herring, as it assumes that all patent owners want a merits decision. It’s definitely possible that a court could find the rules aren’t ultra vires. Unfortunately, there’s no 5th Circuit (or Federal Circuit) case on point. There is however, persuasive authority from the 11th Circuit which held that the “permission” requirement for summary judgment motions was, in fact, invalid. See Brown v. Crawford County, 960 F. 2d 1002, 1006-10 (11th Cir. 1992). It is also difficult to reconcile, for example, the discovery rule regarding document disclosure with the requirements of Rule 26(b)(2)(C)(iii) (current) and 26(b)(1)(as proposed) [As a side note, the proposed changes to Rule 26 will be even more clear. The committee notes on these changes shed light on why these changes are being made and are worth reading]. It doesn’t surprise me that no one has challenged the rules via a mandamus petition. The parties who could afford to do so (as mandamus is not cheap) are parties that are repeat players in ED Tex. They get sued there often, and when ~20% of all patent cases in the entire country are currently in front of Judge Gilstrap, and additional 10% of all cases are in front of Judge Schroeder (per the latest Lex Machina data), defendants may very well be concerned (rightly or wrongly) that judges may not appreciate the rules being challenged. In addition, the lawyers that defend these companies may also not be incentivized to challenge the rules, for their own reasons. In sum: we don’t know whether the rules are in fact ultra vires and the lack of a mandamus petition isn’t conclusive. The only case law on point, albeit persuasive, says that at least one of them is. And until someone challenges them, we won’t know. Mandamus’s are not all that expensive. Five hundred buck filing fee, a brief summary of the undisputed facts, citation to controlling law, a reply brief that can be knocked out in a day. No printing costs. Electronic service. No oral argument. Decision in 2-3 months. One attorney, less than 10k. Maybe, 15k. The problem that big companies have is that they hire expensive law firms that load up every motion with numbers of attorneys. That 10k can quickly become 100k overnight. Well, there’s also the “political” problem that Vera has identified. And we know that’s a real problem because we know that most patent attorneys representing these companies go into court with their hands tied behind their backs. Any doubts about that? Listen to the ridiculous oral arguments in Amdocs v. Openet where 5 highly educated lawyers can’t discuss the elephant in the room. A perfect pro bono opportunity for you. It looks like the panel is struggling. I will keep listening. They exchange I referred to above occurs around the 40 minute mark. Your last point, Vera, that “lawyers that defend these companies may also not be incentivized to challenge the rules, for their own reasons” is probably the real reason, and we all know this. Even some inside counsel like the high cost of litigation because it pads their budgets and avoids a possible negative result that would cloud their both prospects and bonus. Executive management may have the same incentives to avoid a loss. Perhaps only the CEO or the Board may have a different view, but perhaps not. From my discussions with board members, they also seem on board with litigation expenses. I don’t see anything changing here unless and until a small company, lead by people who cannot afford litigation, takes a harder line. The easy and logical way to end this cozy highly lucrative Troll Valhalla local lawyers business in the middle of nowhere is to support the pending bill to restore the specific patent venue statute, requiring some actual relationship to that venue, not just a mailbox or an empty desk. That statute was left on the statute books, but is ineffective ever since a Fed. Cir. decision strangely held that the amendment of the general venue statute had overruled it, without the slightest indication that Congress ever intended that. If they had intended that, they obviously would not have left a specific statute rendered meaningless on the books. curmudgeon, I recall being shocked at the time by that Federal Circuit decision. It was remarkably wrong and wrongheaded. Do you recall whether anyone tried to take that case to the Supreme Court at the time? Still, that was and is only a panel decision. It remains open for en banc review by the full Federal Circuit. Don’t you think it is high time for someone to challenge that construction of the venue statute, especially in view of some members of Congress expressing shock and dismay once they became away of what the Federal Circuit had done? However, the rise in 2015 can’t be so easily explained. Reminds me of Malcolm’s posts…. MM, great analogy there. Business Method Patent owners -> Walking Dead. You can get both kinds of tacos! Plenty sharp enough to take more than 90% of defendants to their bank to buy their way out of their lawsuits after enough invoices from their defense attorneys, which add up fast. Right. That takes some real high quality legal thinking. Following the Eastern District of Texas’s unconventional rules, the defendants filed a letter asking permission to file their Alice motion. Given the potential for wasted time, effort, and money, the defendants very shortly thereafter filed a motion for a stay of the case while the court decided the issue of whether the asserted patent claims are invalid under Alice. The patent owner did not oppose the motion to stay…. The court refused to stay the case [because, according to the court] “the dispositive motion [i.e., the motion for SJ under 101] has not yet been filed”…. This seems practically Kafkaesque: the parties don’t get a stay because they haven’t filed a motion that the court itself prevented them from filing. Shall we all take a look at the claims asserted in this case and have a big laugh? associating the label with the data. Yes, folks, it’s a hierarchical database. The patent, of course, was filed way back in the dark ages of 1992 — a decade before the first computer was built using this patent’s specification as a guide, and when the only available means of storing information was cassette tape. These lowlifes sued hundreds of defendants with this junk. Apologies — this is the patent associated with comment 6 below. I’m sure the “methods of providing a discount” patent is way, way better than this. MM – eff isn’t exactly neutral. That’s like me posting something from HuffPo or Breitbart and trying to say it’s objective. They aren’t exactly st 00pit either. And they definitely aren’t a bunch of dishonest hacks like the hacks behind PatentDocs and IPCrpdog. You should feel free to address what EFF wrote on the merits. That’s like me posting something from HuffPo or Breitbart and trying to say it’s objective. Because HuffPo and Breitbart are just two sides of the same coin, like Bernie Sanders and Donald Trump. Riiiiight. Yep, more one way street “politeness police” action for you. Nine years and running – neither of these even post here. You need examples of the hackery? Happy to provide. Oh wait: I’ve been providing those examples for years already. You, C R P; nine and years and running, I have no expectations that you will, or even can, change. This is a perfect example of the most egregious type of patent troll problem, that is NOT cured by anything in the AIA because it is a JUDICIAL problem, Namely assert patents only against lots of small businesses that cannot afford even an IPR, much less a full litigation defense to collect sanctions, whereby such trolls can easily collect lots of “settlements” from them, or anyone else unwilling to spend a very large amount of money defending themselves. If enough of those small business defendants would agree to cooperatively put all their demanded “license fees” into a joint defense instead, for a joint IPR or CBM and a sanctions demand, and to use mandamus against the refusal of E.D. TX to stay or limit uncontrolled discovery costs harassment before any consideration of 12(b)(6) or S.J. motions, perhaps some of the worst of these trolls would discouraged. curmudgeon, the solution is for some firm to organize the defendants to form a class for the purposes of litigating validity and infringement, but not damages. The class attorney can then move for 12(b)(6) or summary judgment, and have the case disposed of on behalf of the class. The attorney can get paid using Octane Fitness. I actually did something very much like this this back in the day — so it works. And, you wouldn’t believe the a$$ chewing the Chief Judge gave the plaintiff. According to an August study by the Electronic Frontier Foundation, judges there are applying the high court’s Alice decision in a way that leans in favor of patent owners. Just 27 percent of motions arguing that patents are invalid under Alice have been granted in that district, compared with a rate of 71 percent nationwide, the study found. …In a separate order Tuesday, the judge [Gilstrap, who handles the most patent cases in the America] instructed the defendant companies to file a consolidated brief as to whether they were entitled to attorneys’ fees under the “exceptional” case standard. Can anyone explain the drop in Delaware [relative to E.D. TX]? Furthermore, Judge Gilstrap, who has most of the patent suits docket there, recently in “EDekka v. 3–alls.com, Inc., 2:15cv541-JRG (9/21/15) eDekka LLC dismissed approximately 253 cases involving one patent on 101 grounds for claiming unpatentable subject matter, by sua sponte converting Rule 12(b)(6) to summary judgments. If the ED Texas has done a 180, it would seems like defendants are seeking less venue changes. If there are less defendant venue transfer motions in E.D. TX I have not heard it indicated, but if that is the case, it might have more to do with things like their combining of suits on the same patent and the recent sanctions of attorneys filing missleading affidavits in support of transfer? Wouldn’t that indicate the opposite trend? Of course the rise can be easily explained. The Eastern District of Texas is really the only jurisdiction in which patentees routinely survive challenges under 35 U.S.C. 101, especially in motions on the pleadings. So if you were a plaintiff and can bring an action there, why wouldn’t you? But see EDekka v. 3–alls.com, Inc., [cited above at No. 5, with the “B”replaced by a dash in the defendants name to finally get it through the filter] for a new and massive application of 101. Judge Gilstrap in EDTX has previously shown an unwillingness to find cases to be exceptional, and so this may indicate a further redistribution of cases by plaintiffs in an effort to avoid getting socked for attorneys’ fees. It could also be related to 101 issues under Alice, and plaintiffs are seeking calmer waters than the average district court. Be careful around caves! Injun Joe might be in there. Dennis, if there are a lot of infringers, one still would attempt to bring suit in one forum. The forum of choice, over any other, is still, it appears, the EDTex.